One of the World Cup’s underrated appeals is watching players who are jammed into limited roles at club level let their hair down and run around without restraint on the international stage. For example a defensive midfielder, normally tasked with little more than standing in front of the center backs while his teammates have all the fun dozens of yards away in the penalty box, can pull on his country’s colors, break the governor on his engine, and throw himself into attack after attack in a summer tournament. Pretty much every national team has a couple guys who play a more free and adventurous game with country as opposed to club, but no other team at this World Cup embodies this phenomenon quite like Nigeria. There’s no better example of this than Mikel John Obi—the artist formerly known as John Obi Mikel, for those who remember him from his prime Chelsea years, before he legally rearranged his three names. Back in those Chelsea days, Mikel was known primarily for his defensive strengths as a deep midfield shield charged almost solely with protecting the Blues’ back line. His Chelsea managers tamped down on all of the forward-looking industry and attacking verve that made Mikel such a hot commodity as a teen, and instead molded him into a safe, strong, staid defensive-minded player. Mikel always performed admirably in that role and carved out a perfectly respectable niche for himself as a useful squad player for Chelsea, which is nothing to scoff at. Still, the constraining of Mikel’s game lowered the ceiling of a player who potentially could’ve soared if given room to stretch his wings. This is why it’s so refreshing to see Nigeria Mikel, who is much more exciting than Chelsea Mikel was ever allowed to be. Mikel has remained the main man over the years when suiting up for his country. In international play, he’s given the ultimate latitude to dominate the game however he sees fit. The difference between the cautious version of himself from his club time and the barnstorming, all-action, through ball-pinging, box-to-box-run-making player in those gorgeous Nigeria jerseys is like night and day. Mikel’s not the only one. Victor Moses had an up-and-down Premier League career where he hopped around from club to club, never finding the perfect home for his speed, trickery, and creative ability in teams that generally had much better sources of those traits than he could offer. It wasn’t until he was handed a much narrower role as a wingback with Chelsea that he really solidified himself. While that conversion has done wonders for his reputation, it’s also kept him from exercising the attacking muscles Moses would display in flashes during his various stops around England in years prior. For Nigeria, Moses can demonstrate his skills in the final third because he gets to play as his team’s primary playmaker. The same goes for the young and wildly talented Alex Iwobi, who is similarly freed up from having to compensate for the movements of Mesut Özil and Alexis Sánchez at Arsenal and can become the free-wheeling attacking force his teammates need to accommodate. Of course, it’s a reflection of Mikel’s, Moses’s, and Iwobi’s lack of truly elite skills (though Iwobi is young and could still get to world-class status) that they’re asked to subordinate themselves to the likes of Frank Lampard, Eden Hazard, and Özil in club play. Obviously nobody in England would try to build their team around Victor Moses’s creative abilities. Still, it’s a nice change of pace to see those players get loose. And while freeing up Alex Iwobi isn’t going to win Nigeria the World Cup, it can make them a dangerous team that could cause problems for every opponent they face. Normally, promising young Arsenal attackers get overrated to high heaven after breaking into one of former (wow, still can’t believe he’s gone) Arsenal manager Arsène Wenger’s famously thin squads, often on account of an injury to one of Wenger’s famously fragile starters, and looking good for a couple of weeks in Wenger’s famously attacker-friendly system. Iwobi seems to be the exception. He tends to elicit more hatred, or at least overly critical frustration, than many a homegrown Gunner youngster who came before him—which is pretty crazy, because Iwobi is awesome. Iwobi’s skills aren’t always the super flashy kind that call attention to themselves, though he is a strong and fast player with great dribbling and a clean shot who can sprint down the touchline, make a defender look stupid with a dribble move, and then knock the ball into the top corner. The attributes that make Iwobi so impressive and consistent are more subtle. The 22-year-old is a genius in the final third. He’s phenomenal at keeping possession in the tightest of spaces, dragging the ball between his feet and sashaying through defenders rather than blowing by them. His decision-making is superb; he always knows when to try to squeeze the ball through the defense to a teammate in the penalty area with a delicate little pass or when to send the ball back to a player in a safer position in order to wait for the fatal crack in the defense to reveal itself. Iwobi’s compensatory movement, too, is already great at such a young age. He’s always naturally drifting around the pitch in response to where his teammates are, calculating immediately where best to position himself in order to maximize his team’s chances of scoring. All the physical and technical skills Iwobi is blessed with pale in comparison to those mental ones, and it’s his head that should ensure that he doesn’t become the next Arsenal prospect to fizzle out. His breakout 2016-17 season with the club put him on the map, while a seemingly less impressive season this past year tampered the buzz around him somewhat. The woes of this past season’s Arsenal campaign shouldn’t put too much of a damper on the excitement around Iwobi, not when he has clearly improved in key ways despite the turmoil around him, and his importance in the Nigeria team should prove once again why so many have high hopes for the kid. Nothing like a World Cup to announce yourself to the world. If you’re looking for some soccer apparel to cop this summer, we definitely recommend something from the Nigeria collection. Though if you’re looking for something that doesn’t have anything to do with the World Cup, try the U.S. jerseys. The first thing you want to do at an international tournament to make sure you’re hard to beat. Nigeria have that covered with a respectable defense and a tough-as-nails midfield. Leicester’s Wilfried Ndidi is one of the best defensive mids in England, Ogenyi Onazi is solid, and when Mikel John Obi is your central creator, you’ve got a midfield that no one is going to just run through. Even Argentina should find it hard to crack the Nigeria defense. After you’ve made sure you can keep goals out, the second thing you need is the ability to score some goals. Mikel will be the main guy linking the back half of Nigeria’s team to the advanced players. In him, Iwobi, and Moses, the Super Eagles have loads of creativity. Nigeria’s offensive strategy is primarily counterattack-based, which capitalizes on the speed and power of their strikers and wingers. And in a game like the one against Iceland, where Nigeria will be confronted with a deep defense that doesn’t offer much space to break into, they have the passing of Mikel and especially Iwobi to wrench through the obstructions. Once Nigeria do get the ball into the final third, they have plenty of finishing ability. 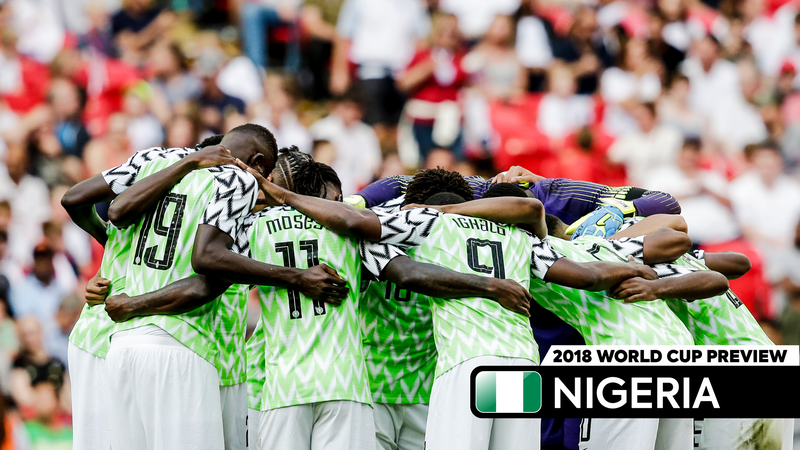 In Odion Ighalo, Kelechi Iheanacho, and Ahmed Musa, Nigeria have three guys adept at putting the ball into the back of the net, both from central areas with the former two players and from out wide with Musa. Because they’ll likely start in a 4-2-3-1 formation, Nigeria will have multiple potentially game-changing players waiting on the bench to do damage should they find themselves pressing for a goal. The competition in Group D is tough as hell, so it’ll take work for Nigeria to fight their way into the Round of 16. Should they get there, though—and they absolutely could—Nigeria should be suitably prepared to maybe make a push into the next round or two. It’s not likely, but all the raw materials for a memorably deep World Cup run are all there. The rest is up to them.